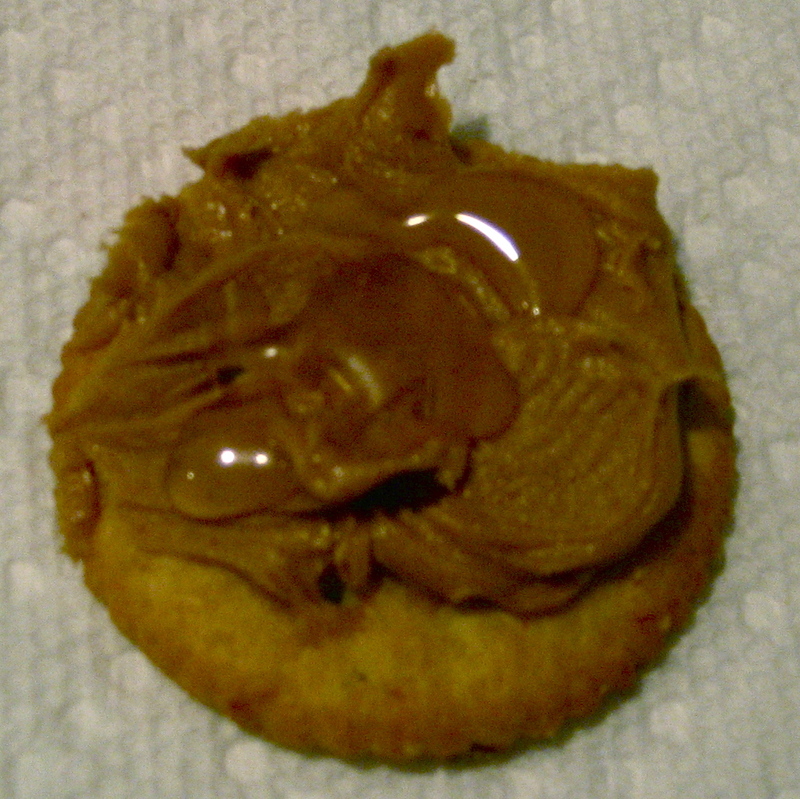 A Ritz Roasted Vegetable cracker covered with peanut butter and a dollop of honey. It's a delicious thing. Some days I like to go gourmet. No, today is a Ritz Roasted Vegetable cracker with peanut butter and a dollop of honey day. And that means I’m keeping my day simple and delicious. This elaborate recipe occurred to me a few months ago. I knew that a Ritz cracker tasted good with peanut butter and then covered in chocolate. That’s a favorite Christmas holiday staple. So those sweet memories no doubt led to a sudden craving for a Ritz cracker with peanut butter (hold the chocolate for health’s sake). The cracker/peanut butter combo tastes good, but it can be hard to get down the gullet. It’s a bit sticky, you see. THAT is where the honey comes in as not only the perfect accompaniment to the snack, but it also makes for smooth traveling into your belly. I personally guarantee it. Chef’s honor. What’s your lazy Sunday afternoon delight (and I’m talking snacks here!)? It’s Friday, and you probably need some good material to impress your friends this weekend and make them laugh. You, after all, should be the life of the party. Well, allow me to help by putting you on the cutting edge of Scottish stand-up comedy. The Edinburgh Festival Fringe will soon (and sadly) be coming to a close for the year. Never heard of it? According to its website, the Fringe Festival is the largest arts festival in the world. It takes place every August for three weeks in Scotland’s capital city. I inevitably only get to read about the cool happenings there every year, but perhaps I’ll one day be able to make the trek and take in this glorious event. No doubt I would find plenty to entertain and inspire me. One of the elements of the festival is a joke contest, which brings me back to my promise to give you some weekend material to share with your friends. May laughter ensue. (I swear I’ve heard some variation of Joke #7, which mentions one of my all-time favorite bands, The Cure …). Comedian Nick Helm has won an award for the best joke of the Edinburgh Fringe. The up-and-coming funnyman was given the prize by digital TV channel Dave, whose panel put a selection of their favourites to a public vote. Last year’s winner, quick-fire joker Tim Vine, was beaten into second place by Helm. Helm said: “I knew my joke was the funniest joke of all the other jokes in 2011. Veteran entertainer Paul Daniels won the wooden spoon for the worst joke of the festival. But it’s the quieter moments like “Other Towns And Cities” above that really get me. I love lead singer Tracyanne Campbell’s voice, which I find sad, romantic and classic. 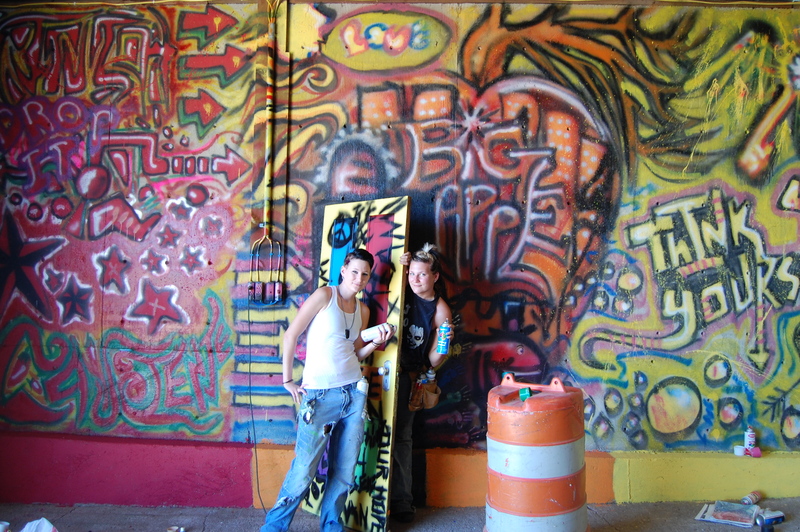 Nathan Johnson/P&D — Brandy (left) and Brittany Hinkel were employed by Kip and Kris Larson of rural Hartington, Neb., to paint graffiti on the interior wall of a machine shed. It will be used as a photo backdrop by Kris, who owns a photography business. In this business, a story will sometimes sneak up on you. When my friend Kip Lammers called with a story idea about how two teens were painting graffiti in his machine shed so his wife could use it as a backdrop for her photo business, I thought it would make an interesting feature story. After all, how many rural residents do you know who would pay someone to paint artwork on their machine shed? I grew up on a farm, and that subject never came up. So on the face of it, the story sounded promising. What I wasn’t counting on is how charismatic, fun and talented Brandy and Brittany Hinkel would be. They were exactly what you hope for from a story subject: open, honest and completely at ease with you, a complete stranger who happens to be a reporter. As someone who has written about feeling like a bit of a cultural outsider in this sector of the world, it was apparent that I had found people who struggle with the same issue and have found good ways to cope with it. I left the Lammers farm last week feeling a little more lust for pursuing life on my terms and definitely a bit wiser — all thanks to the Hinkel twins. Gracias, ladies! And good luck with your future endeavors! This is my favorite image. 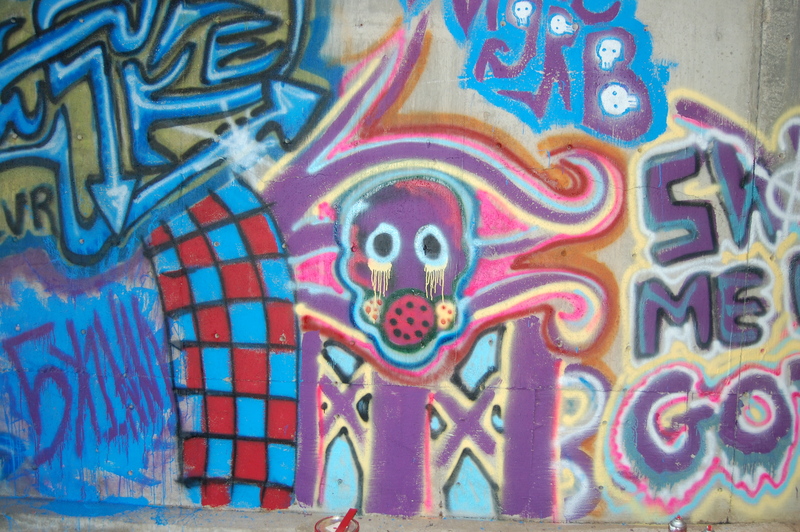 I find gas masks creepy — and, therefore, cool art subjects. By Nathan Johnson/P&D — I enjoy how the electrical wires make it look like a pitchfork is hanging on the wall. HARTINGTON, Neb. — Walk into an aging farm machine shed about 20 miles south of Yankton, and you enter a vibrant world full of color, bold slogans and symbolism. This is the world of Brandy and Brittany Hinkel, 18-year-old mirror image twins who graduated from the Hartington Public School system this past spring. Originally, the concrete walls of the building held silage. Later, a roof was put on the structure to hold farm equipment. 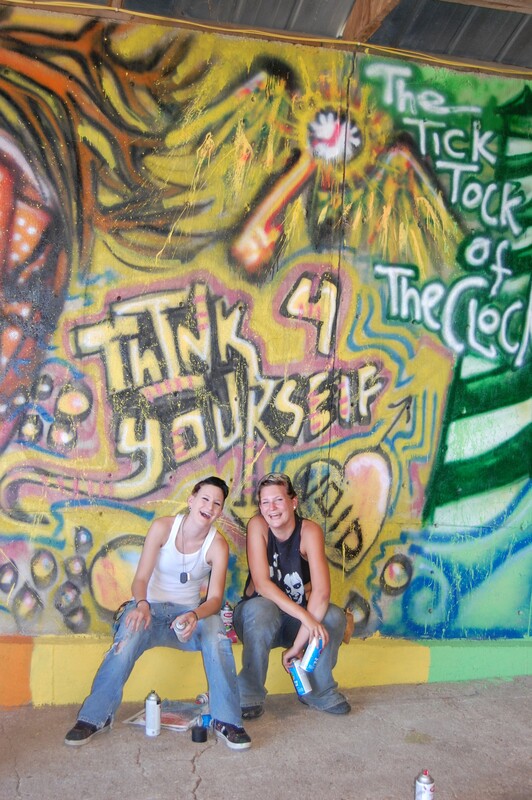 Now, it’s home to the graffiti of the Hinkel twins. Kip and Kris Lammers hired the two women to paint the inside of the rural Hartington, Neb., structure so it can be used as a backdrop for Kris’s photography business, KL Photography. After seeing the work of the Hinkel twins throughout their high school career, Kris knew she wanted them to create a work of art on the farmstead. The idea was sparked last year when Kip saw news reports questioning the value of graffiti as an art form. By this summer, he had space cleared away in the shed so the women could begin painting. 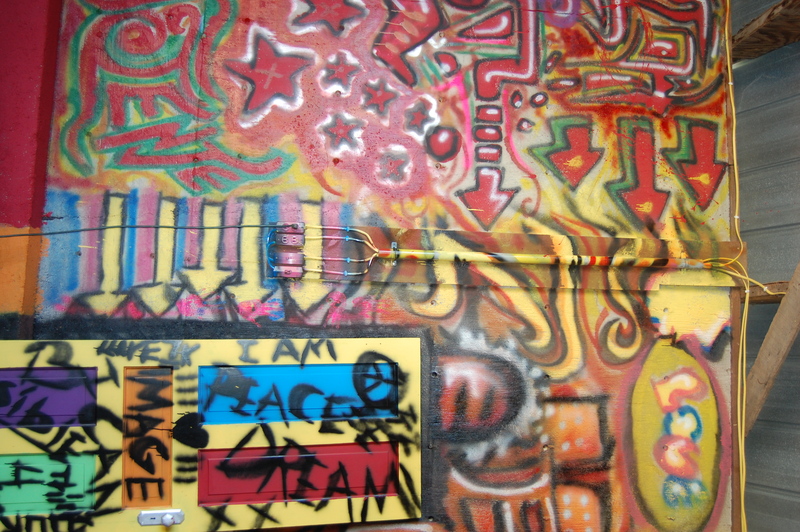 One wall of the building is covered in graffiti, although the twins have chosen a handful of colors and themes that change in increments. A lot of the inspiration for the art came from the music of bands like Eve 6, Insane Clown Posse, Kottonmouth Kings and Everlast, they said. The art can do that literally, such as a robot telling its audience, “Don’t be a slave to society,” and a slogan of “Think 4 yourself” — or it can take a more symbolic approach, such as a doorway that Brittany said symbolizes a gateway to a better tomorrow. The subject of freedom is close to the hearts of the twins, who describe themselves as “goth” kids in a small rural town. Members of the goth subculture generally dress in dark attire, wear heavy makeup and have elaborate hair styles, though there are many variations. The girls say they’ve been called Satan worshippers and asked if they make voodoo dolls, but those kinds of comments now roll off their backs. It took time, but they have realized that they need to be themselves to be happy. Hartington Public School and the community of Hartington, in general, has been very supportive, they added. And if someone looks uncomfortable because of their style, the twins have developed methods of engaging that person. Brittany said residents at the nursing home where she is employed have embraced the pink in her hair. And Brandy’s haircut, which includes closely-shaven portions with purple stars painted in, still provokes reactions. An interest in drawing runs in the Hinkel family, and it’s a hobby the girls developed before they can even remember. They would cover their bedroom walls in drawings — and the occasional closet, as their mother reminds them. Brandy had been commissioned to paint a room before, but this is the first large-scale project that both women have worked on together. It’s also the first time they’ve done actual graffiti. They said they often work on the wall at separate times but still manage to complement each other’s work. Approximately 50 hours have been put into the painting between the two of them, and they are nearing completion. When the twins are laboring together, “We yell a lot, but that’s just us getting along,” Brittany joked. This fall, both will be attending Northeast Community College in Norfolk, Neb. Brandy will be pursuing a degree in business entrepreneurship before going on for a graphic design degree elsewhere. Brittany will get her general education requirements out of the way before pursuing a forensic pathology degree at another institution. It will mean they both get to live with each other for at least a few more years. In the future, Brandy, especially, is eager to take on new art projects. It’s little surprise that nobody wants to be on the bottom rung of the economic ladder. But what I do find surprising about the study below is the lengths the people on the second rung will go to in order to keep those on the bottom rung in place. Why? They fear being left on the bottom rung themselves. The study be Ilyana Kuziemko, Ryan W. Buell, Taly Reich, Michael I. Norton explains a lot of strange political phenomenon where people appear to work against their own economic interests. Why do low-income individuals often oppose redistribution? We hypothesize that an aversion to being in “last place” undercuts support for redistribution, with low-income individuals punishing those slightly below themselves to keep someone “beneath” them. In laboratory experiments, we find support for “last-place aversion” in the contexts of risk aversion and redistributive preferences. Participants choose gambles with the potential to move them out of last place that they reject when randomly placed in other parts of the distribution. Similarly, in money- transfer games, those randomly placed in second-to-last place are the least likely to costlessly give money to the player one rank below. Last-place aversion predicts that those earning just above the minimum wage will be most likely to oppose minimum-wage increases as they would no longer have a lower-wage group beneath them, a prediction we confirm using survey data. I also managed to locate the paper in its entirety. Find it here. I’ve included part of the introduction below. Fascinating work. text, scholars often argue that racial, ethnic or cultural divisions (Woodward 1955; Alesina et al. which increases competition and inhibits political unity among members of lower-income groups. The House of Loom had a soft opening three or so weeks ago. Several creative types — a handful of indie rockers, a few actress-models and playwrights — sipped specialty cocktails, ate papaya and listened to electronic beats. It held its official grand opening Saturday with its annual all-white attire party. The three partners hope to use the space as a bar five nights a week. They also plan to host poetry slams, dance parties, art exhibits and educational lectures. It’ll serve as a space for creative types to debut their work. For instance, Omaha fashion designer Megan Hunt (aka Princess Lasertron) hosted a secret preview show for her Omaha Fashion Week collection at the lounge last week. The building has lots of character: hardwood floors, brick walls and high ceilings. The place formerly housed the Goofy Foot and Planet Soull nightclubs. The guys have poured tens of thousands of dollars into renovating the space. They laid concrete to flatten the patio, added an outdoor garden, painted, stripped away metal, stained floors and the bar and added tile, light fixtures, Victorian furniture and a custom DJ booth. They know how to keep the party intimate, even while the layout is grand with multiple rooms and ample lounge space. The sit-down lounge area has a Bohemian-eclectic flair, with velvet crush privacy curtains and a fireplace. A dance floor sits just inches away from the bar. Dushan is curator of the lounge’s artwork. Chris Engles, formerly of the Boiler Room, is the craft cocktail bartender who will mix champange cocktails, dirty martinis and pre-Prohibition-inspired drinks. The bar will make its own syrups and juices from scratch. For instance, when Engles makes a seven-and-seven cocktail (a Seagram’s 7 whiskey and 7-Up mixed drink) he won’t use the soft drink. Instead, he’ll make his own interpretation of it with fresh limes. “This place exists on the premise that there are enough creative alternative thinkers in Omaha that’ll identify with a place that matches their lifestyle,” Crampton said. You can read the whole Omaha World-Herald story here. Creatures Great And Small Know The Heat Is On, Why Don’t We? As a reporter (and an average joe), if I don’t know much about a subject but am curious about it, my first course of action is to consult the experts in the field. Who is going to know more about a subject than people who deal with it full time? That’s why I continue to be puzzled by the amount of climate change skepticism I encounter. Granted, the oil industry and other interests have spent a lot of money to confuse people on the subject. But the verdict is in among the experts. The new research supports the idea that the vast majority of the world’s active climate scientists accept the evidence for global warming as well as the case that human activities are the principal cause of it. The study demonstrates that most of the scientists who have been publicly identified as climate skeptics are not actively publishing in the field. And the handful who are tend to have a slim track record, with about half as many papers published as the scientists who accept the mainstream view. The skeptics are also less influential, as judged by how often their scientific papers are cited in the work of other climate scientists. Despite the fact that the alleged “Climategate” of a couple years ago was proven to be a lot of hot air, many people seem to have lodged it in their brains as another reason for doubting manmade climate change. I’m not saying that experts can’t be wrong or they should not be questioned (look at the business I’m in, after all), but the denial of climate change doesn’t seem to be based on any understanding of the facts. People usually express to me a doubt that scientists could understand anything as big and complicated as the global climate when they can’t predict the weather two days from now. Or they may dislike Al Gore and discredit climate change from there. A cold front in the summer has also been used to deny climate change in conversations I’ve had. Meanwhile, scientists keep amassing more evidence that manmade climate change and its effects are very real. The species – mostly from the Northern Hemisphere and including plants – moved in fits and starts, but over several decades it averages to about 8 inches an hour away from the equator.